For the comparative, synthetic analysis the POVFISH project it will be designed and coordinated so that all elements and relationships in the model are addressed through our joint effort. The individual country case study may be limited to one, two or several of the streams (identified by numbers in the model). To ensure full model coverage, however, the selection of emphasis must be somehow coordinated. Each case study shall be reported in terms of a publishable article according to good journal standard. The article should be descriptive but also theoretical and argumentative. Articles are expected to be based on primary research (not review articles) containing fresh, new insights. 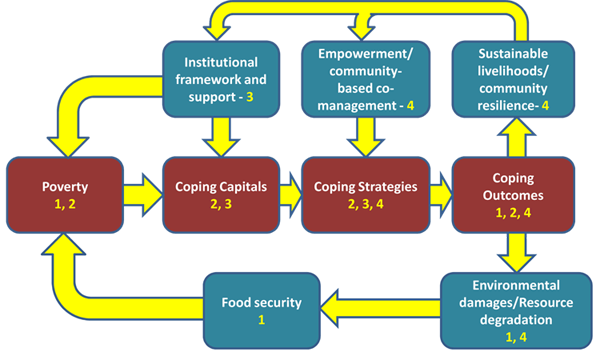 Case studies should be carried out at the level of local communities (one or several) (micro) and/or regions (meso).